Overview : Walk to Himalayas offers a rare opportunity to discover compellingly beautiful and remote regions of Ladakh, combining an honest and sustainable approach with simplicity and style. Homestay is a unique and interesting opportunity to stay with local and mostly with rural people. Staying in village houses offers the visitor a rare chance to experience a rural way of life in the homes of the Ladakhi people. By patronizing homestay you help local people to generate income from tourism areas and reduce the strain on the ecosystem caused by camping. You get to enjoy Ladakhi food, meet local people and experience the Ladakhi culture and lifestyle. Early morning fly from Delhi to Leh. You will be met and driven to our Village Home Stay in Stok where we recommend complete rest so that you can thoroughly acclimatize. Stok lies south South of Leh on the opposite side of the singe Tsangspo River. 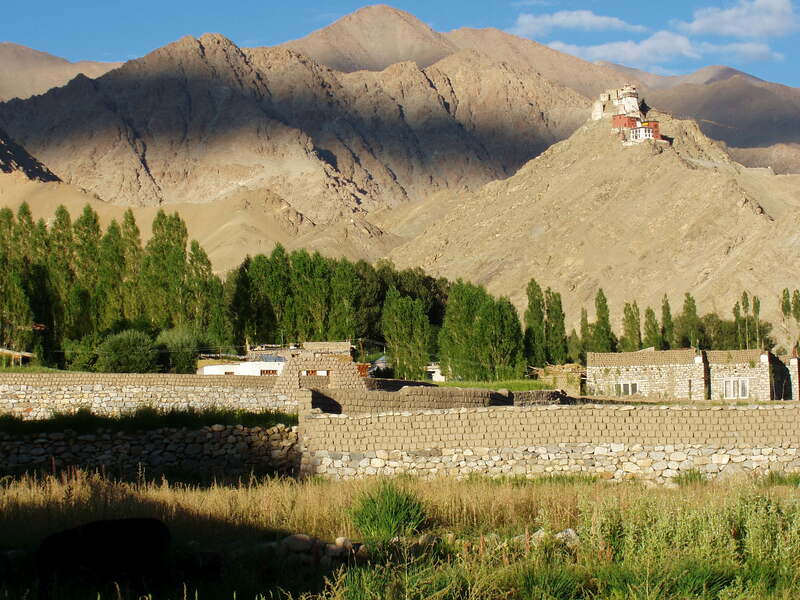 Take a gentle walk to explore the charming village of Stok. Visit the Stok Palace, which is home to the king and queen of Stok. The castle was built on a hill at the end of village in about the year 1825 by king Tsespal Tondup Namgyal. After visiting the Stok palace we take a hike to beautiful Stok George. Later we walk back to Stok and spend a night in Village Home Stay. In Stok there is also the sacred monastery of Gurphug, a branch of Spituk Monastery. On the 9th and 10th days of the first Tibetan month of the festival called the “Guru Tshechu” is held during which the monks of Spituk Monastery come to perform the sacred dances. At that time two gods make their appearance. The fascinating Museum exhibits old and unique Ladakhi artefacts. Return to the house and relax while enjoying great views of the Stok Kangri Range. Early this morning you will attend the morning prayers at Thiksey monastery where you will witness young and old monks begin their day with prayers and chanting. You can even meet a local Ladakhi medicine man at the monastery and learn about traditional cures. Thereafter return to the village house for breakfast and to freshen up. Later in the day you will visit the beautiful Hemis monastery which was built in 1630 and is the largest monastery in Ladakh. You will have this evening at leisure. This morning you will be driven to Leh Airport in time to check-in for your return flight to Delhi.